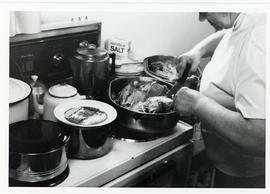 This photo shows Trudie Unrau preparing meat for cooking in the kitchen of the Walnut receiving home. 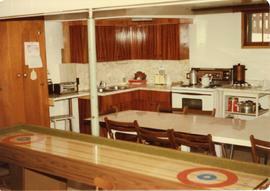 This photo shows the eating and recreational area in the Walnut receiving home. 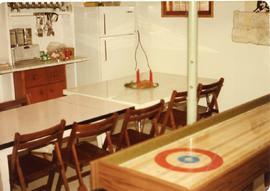 The table was large enough to seat a good number of persons. 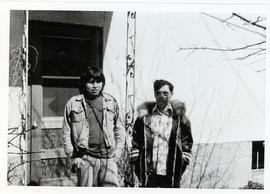 This photo shows an Eskimo guest at the Walnut receiving home. 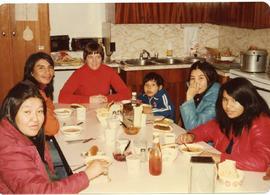 This photo shows a number of guests at meal time in the Walnut receiving home. In the photo is Miss -- Bueckert, a voluntary service worker. 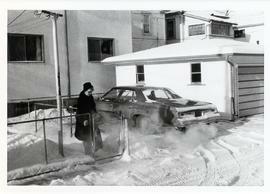 This photo shows Trudie Unrau returning from a shopping trip to Safeway to the Walnut receiving home. 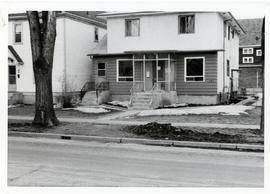 This photo shows the Walnut receiving home at 171 Walnut Street, Winnipeg, Manitoba. 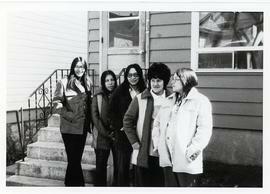 When natives came to Winnipeg for medical services they were received here. Medical Services paid (to Walnut receiving home?) $7.50 per day.